last sunday was my first time playing along with "steppin' out saturday" hosted by mandy over at harper's happenings & i had such a good time that i decided to get dressed up & step out not once, but twice this weekend. 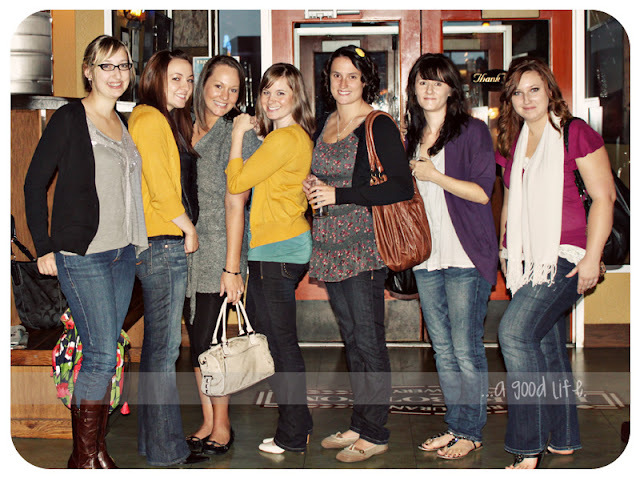 last night i had my first bloggy mom blind date. i got to meet some of my fave local bloggers & guess what? it wasn't weird at all. it was a total blast. it was like i already knew these girls! we all knew each others' faces, names, baby's daddies & of course, lots about each others' babies. we had a really good time. some tasty apps at rock bottom brewery & then froyo at ce fiore. each girl is as genuinely sweet as she comes off in her blog & we all had lots to talk about. there will definitely be a repeat. so since this is a "steppin' out" post we're supposed to talk clothes & outfit. you can see mandy & i have the same great taste in mustard color sweaters from target. go us! here i am recycling last night's outfit today for church. except this time i paired the top with a black skirt. what? don't tell me you've never done that. worn the same outfit back to back with different groups of friends? oh yeah, we've all done it. to see other moms & their digs, check out harper's happenings by hitting the badge below. i'm hoping for a dad's edition of steppin' out saturday next week. i think the blog has been lacking in some testosterone lately so i'll do my best to get sam in front of the camera. not his favorite place though so wish me luck. wish us luck by voting to keep us in the top twenty-five! the view is beautiful from here. Oh hey, I know Jill! Online, I mean. Wow all your local mom bloggers are INCREDIBLY good looking. It makes me glad I don't have to meet people in person - hiding my double chin is much easier after I edit the pictures. How fun! That's nice you all got together! You guys look great. Hello from another N.W. 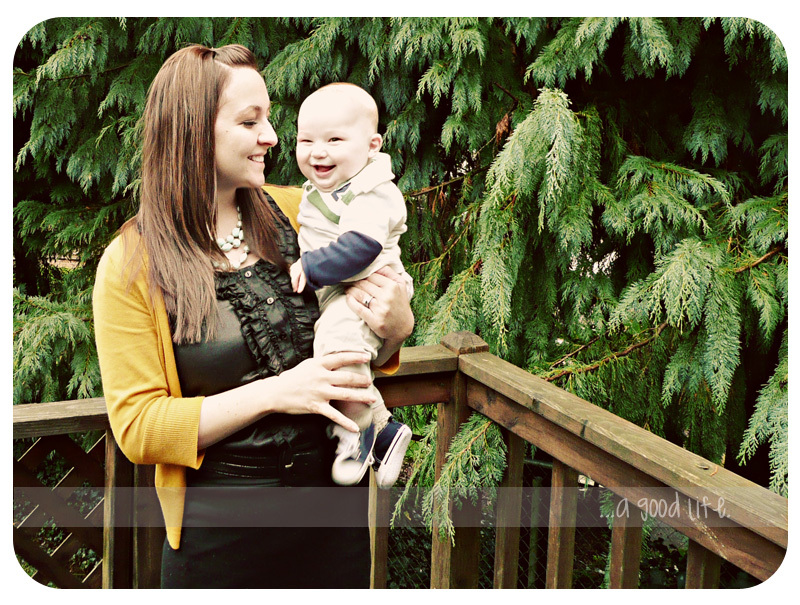 (old) mom :) Love your blog and am a new follower! I had so much fun! You are so awesome. So great to meet you! I had a wonderful time with you Mommas! omg that looks so fun!! I might need to tag along next time, we are in vancouver but I would totally make the drive!! you girls are too cute! i can't wait for our next get together. How fun!! You look great! I have definitely recycled and outfit before. I'm so jealous you guys all live close enough to get together! oh amy! im so glad you drove up to meet us! when i got home ryan asked how i liked you and i was like, "oh i love her! she is SOOO FUNNY!" im already excited for the next one too!!!! You look great! And I love the new hair color! And I'm interested to know what you decide on the stroller strides. They have it out here, but I just don't know if I'm willing to pay for something like that. I got a kick out of that post. You and Mandy cracked me up with your matching cardigans!! Look at how cute Parker is! He's so happy or you just told a funny joke. I heard he likes those. I'm coming up with my best ones for this weekend! Brace yourself Parker, its going to give you a tummy ache! I love the photo of you two!